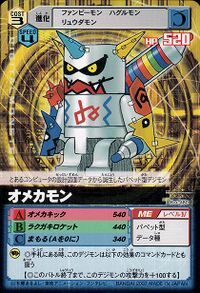 A Puppet Digimon born from the data of a certain computer's design drawing. 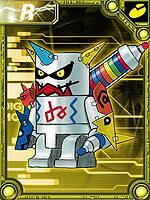 It doesn't know who it is, so for now, it dresses as one of the holy "Royal Knights", who are famous among Digimon. Its Rakugaki Rocket, which fires off the pen it carries on its back like a rocket, stains the body, annoying other Digimon. As for the pen, it seems it found it within a certain computer's art software. Its Special Move is its unexpectedly powerful "Omeka Kick". Its name is meant to be a take on Omegamon. 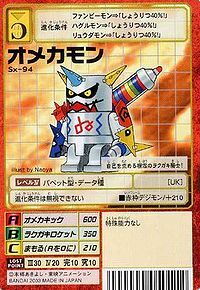 Rakugaki Rocket  Graffiti Rocket ラクガキロケット Rakugaki Roketto Paint Rocket Shoots the pen on its back at the foe. Can be evolved from Kotemon if above level 22 and Machine EXP 580. Can evolve to Tekkamon if above level 37, attack 170, and speed 150. 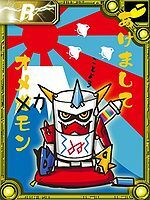 Omekamon can only be obtained as a collectible card. Its card is part of the From Toy Land (おもちゃの国から Omocha no Kuni Kara) set. Omekamon s available as a Digimon Medal. 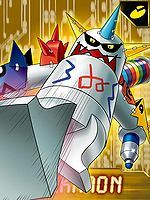 Omekamon is available as a Digimon Card. Omekamon is available as a Digimon Medal. Evolves from DORUmon, Funbeemon, or Ryudamon. Can evolve to Cannonbeemon, Hisyaryumon, or Metal Fantomon. Can also Jogress with Ginryumon to evolve into Hisyaryumon. Can also Blast Evolve into Metal Fantomon or Metal Piranimon. This imitation scribble-knight seeks to find itself! 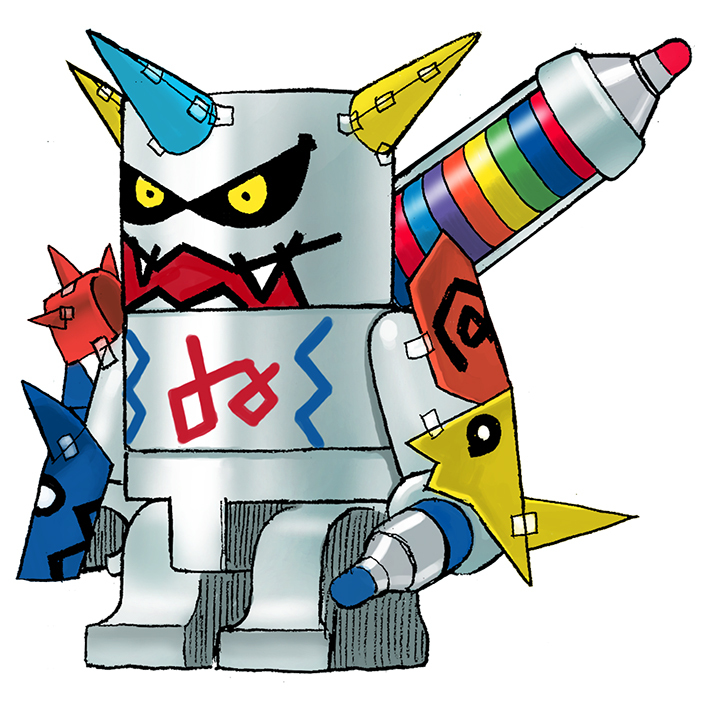 A Puppet Digimon born from the data of a certain computer's design blueprint. This page was last modified on 2 December 2018, at 00:21.